This year is different. Why? I’m not sure yet. There is a lot of reflection going on since my return from PASS Summit 2016. As I look at the long laundry list of “to do’s” to get completed in the office; this past PASS Summit reminded me to slow down and take a minute to breathe – to take it in so to speak. The recap post you are about to read will be a bit different from my past ones; gone is the synchronous order of how each day went. Instead, this post will be more relaxed and share view points through my eyes on how I went through the conference in which I’ve come to have a strong passion for. As you first come into Seattle it is very difficult not to see a lot of its natural beauty. It never ceases to amaze me when the plane flies past Mt. Rainier and the breath-taking views that it holds. I often wonder to myself what it must be like to be near something on such a grand scale. I remember back to my first PASS Summit when I would be in such a hurry to get to where I was going; I took things like this for granted – not anymore. One thing I’ve come to thoroughly enjoy is noticing all the “first timer” ribbons. The look of excitement and overwhelming elation of knowledge that has been received all over their faces speaks volumes. If you are ever walking around and notice someone with this ribbon on please take a moment and see how their day is going; offer them some encouragement if needed. I was once in their shoes and I remember how I felt at my first conference. This year I had the pleasure of speaking at SentryOne’s Boot Camp. One thing is for certain; this shop knows their stuff and have a stellar crew in place to bring excellent products to the community. Some colleagues of mine (Monica Rathbun (b|t), John Morehouse (b|t), and Chris Wood (t) in the community shared how SentryOne has helped in our respective shops and businesses. I spend a lot of time in slide decks for my current work and this was no different; I had some slides made up and was planning on talking from the slide deck, but as I got up on stage I had a “change of heart moment”. I wanted to divert attention away from the slides and just have a heartfelt conversation with the attendees on what I felt was important. After initiating the “wave” in the crowd (yes folks Kevin Kline (b|t) was involved) we had a good talk and I was happy to be a part of it. Some better terms in being a part of the boot camp are thankful and blessed. The keynotes were nothing short of amazing. For the second year in a row I had the privilege of live blogging. It’s always fun to provide data professionals who are not able to attend an avenue to get the information from the conference. I did get a kick out of sitting next to Rob Farley (b|t). We’ve become friends over the years and always look forward to seeing him; not sure how he gets hand delivered coffee while live blogging, but then again – – it is Rob Farley. Speaking of friendships; a good friend reached out to me earlier in the week letting me know he’d be near by. After some going back and forth on timing I felt it was important to leave the conference and share some time with him. Tom Roush (b|t) has been an inspiration to many and he allowed me into his life a little bit that day. It was the first time I got to meet his wife Cindy in person; together all 3 of us were able to share a cup of coffee and just talk for about 30 minutes. This, to me, is what PASS is all about. I would have never had the opportunity to meet Tom several years ago had it not been for PASS and the mentality of Share, Connect, Learn. 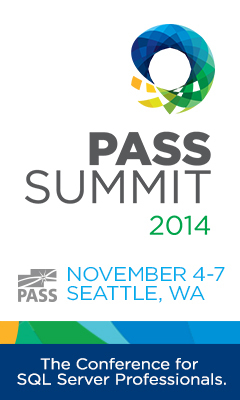 The PASS Summit is much more than just a technical conference; it is a people conference. It is a place where friendships are made, ideas our bounced off of each other, and a place to grow. Tom, here is to you buddy ~ cheers! Sponsors are huge at events like these; wouldn’t be able to put on a good show without them. As I walked through the vendor area my mind began to wonder just how many people each of these vendors have reached. If you look past all the swag and fluff you’ll find that these vendors are doing some phenomenal things for the community. I’ve already mentioned SentryOne above, but another one that has had a huge impact on me personally is RedGate. Yes, I am a Friend of RedGate and yes I utilize their products at the shop – one thing that stands out to me is their strong passion for the community in which they serve and have built a business for. I cannot go through and name every vendor, but from me to every one of you ~ I thank you. The conversations had this year were amazing. You’ll find these happening in one off’s all over the convention center, restaurants, hotel lobbies, etc. I’ve never been to a PASS Summit where I haven’t had a conversation that has either helped or inspired me. Mike Fal (b|t), Mike Walsh (b|t), Warwick Rudd (b|t), Wendy Pastrick (b|t), Tom Larock (b|t), TJ Belt (b|t), Tim Ford (b|t), and Steve Jones (b|t) had a huge impact on me this year. It’s humbling when individuals take time out of their day and just pull up a chair and talk. Investing in others is key; I’ve had a lot of people invest time in me; what am I going to do now? It’s time to invest in others the same way and build up another generation of data professionals. One aspect of the conference I was extremely pleased to help with was Steve Jones and Andy Warren’s idea for a networking dinner. I had spoken briefly to Steve prior the meetup as he was needing some hands to help. It was after the sessions had ended and we were to congregate in the lobby at the convention center. I didn’t know what all to expect; just knew that help was needed. What unfolded next was pretty amazing…..seeing people from all around coming up to talk about their interests and have the ability to meet new people. Saw a lot of “first timers” again and getting them paired up with 4-6 people in a group was something to behold. The event itself was very successful and hopefully if one person was reached or changed then it was all worth it. Nothing but respect for Steve and Andy, would gladly go into battle with either of them any day of the week and twice on Sunday. This year had a twist for me in that I was invited to eat lunch with Rimma Nehme, Mark Souza, and Mitra Azizirad from Microsoft. This opportunity, along with five other data professionals, was nothing short of amazing. A casual conversation over a myriad of topics on how we as data professionals relate to Microsoft at our respective shops. I could see quickly that we were in the midst of some great minds, and trying to be a sponge is an understatement. Another highlight was getting to see, as I was live blogging, Malathi Mahadevan (b|t) receive the PASSion Award for 2016. I’m a product of the hard work she has put in over the years. Her tenure has spanned a decade now here in the Louisville, or as we call the ‘ville. It has only been a few years since we have crossed paths; little did she know when she started down this path for SQL Community how big of an impact she would have. It’s an honor to serve along side her and a testament to what hard work can do; sticking with something through both good and hard times. Job well done and well deserved. You can read her blog on the award here. Thank you to all the PASS volunteers, staff, sponsors, speakers, convention help, caterers, attendees, etc. It takes all of us to make the wheel go round…..until next year.